Although Edgar Melchor tries to study on the A-train, he can’t pass up the opportunity to look out at the scenery from the A-train windows while relaxing in his seat! 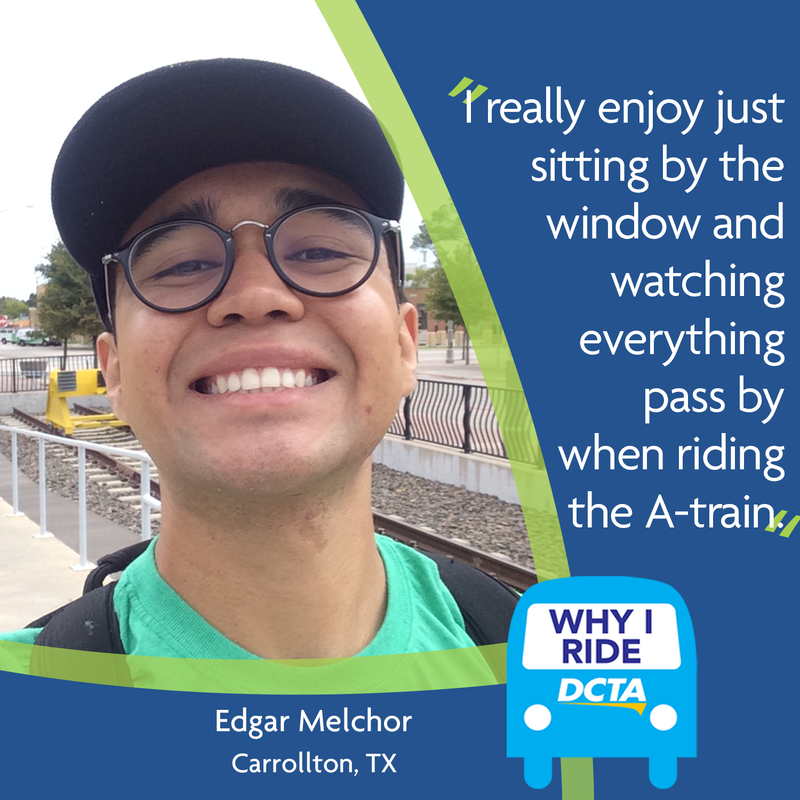 Read on to see why else Edgar loves riding DCTA. Q: What do you enjoy most about riding DCTA? A: I love how clean DCTA vehicles are during my commute. The ride is always smooth and the atmosphere is good. In addition, I also enjoy how cool the buses and trains are in this hot Texas weather! A: I’m a college student, so I “try” to read most of the time while riding the A-train. However, I really enjoy just sitting by the window and watching everything pass by. It is one of the few times you can really pay attention to nature. A: Ask questions when riding DCTA services for the first time if you feel lost. One stop and it could kill you time-wise. A: I am a 20-year-old, pre-nursing student at Texas Woman’s University, as well as a first generation college student. I agree it can be a challenge to read when the scenery is more appealing!